I’m going to just say it. I’m biased towards Paula’s Products. 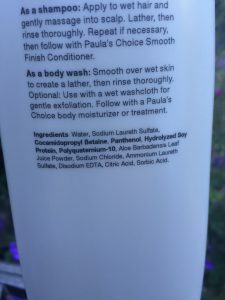 It was Paula, in her book Don’t Go Shopping for Hair Care Products Without Me that taught me to ignore all the miracles they tell you a product will perform on the front of a product, and just read the ingredients (the only place manufacturers have to tell the truth). That being said, I did look up all her ingredients, and I’ve used this shampoo for many years now and been happy with it. This is the shampoo I use when my scalp really feels like it needs a cleansing, as it’s one of the more cleansing of all the ones I recommend. This shampoo has no fragrances, or dyes so it would be good for a child or someone with a sensitive scalp, since no sensitizing essential oils are used. Unfortunately, you can only get Paula’s products online if you’re interested in trying them.